Welcome to Lakewood Ranch! Polo Run is one of LWR’s newest and most popular developments! As LWR’s only solar powered community, Polo Run is on the TOP of every buyers list! This new waterfront home has zero wasted space and is designed for the Florida lifestyle. The entire home opens up to the covered lanai and pool area where the outdoor space covers the entire length of the home. The family will enjoy endless summers by the pool and all will enjoy the setting sun on the lake. The cook of the family will enjoy the ample counter space as well as cabinet storage. And yes, the kitchen provides breathtaking views of the pool and lake as well. Cooking will also be a pleasure with the gas cooktop and large walk-in pantry. The owners suite has a seating area and the en-suite offers a garden tub and large walk-in shower. This split floor plan provides maximum privacy for the owners and the children and guest to enjoy each area of the home. Brick paved drive and walkway as well as a tile roof bring home the Florida lifestyle! The community boast a BRAND NEW amenities center with large pool, covered area, outdoor kitchen, clubhouse, fitness center, yoga and dance studio, tennis courts, playground, pickle ball and so much more! These state-fo-the-art amenities are designed to perfection and is what’s driving so many buyers to Polo Run. 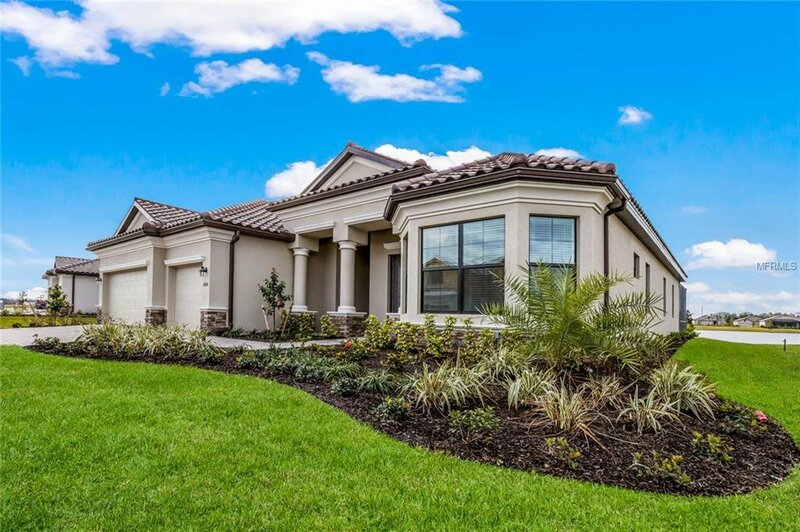 This home and community is a MUST SEE on your Lakewood Ranch list! Listing courtesy of FINE PROPERTIES. Selling Office: FINE PROPERTIES.